A premium balanced blend of 35 essential vitamins, minerals and insurance nutrients formulated for men and women in the 50+ age range, or for those women already in their post menopausal years. The formula is iron-free which is most important for this user group. Iron stores in blood have been found to increase the potential for heart attacks. Other benefits include: 1. higher than normal levels of E, B12, Folic Acid and Selenium for heart health 2. higher than normal calcium levels to combat osteoporosis 3. higher than normal potassium levels to support fluid balance 4. higher than normal manganese levels for energy production 5. higher than normal levels of chromium to regulate blood sugar levels 6. higher than normal levels of zinc to support wound healing and immune system health. 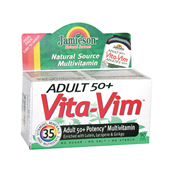 Fortified with Lutein, Lycopene and Ginkgo Biloba extract to support healthy brain and circulation function.